Serving as an Internal Advisory Board member of the Arthur C. Clarke Center for Human Imagination at UCSD helps me locate my research on speculative culture and work with Clarion in interdisciplinary contexts and create exciting events on and off campus. On this page, you will find photos, videos, and stories about events I have co-curated in the last few years involving Ted Chiang, Ursula L. Le Guin, Kim Stanley Robinson, Nalo Hopkinson, George R. R. Martin, Jeff Vandermeer, and other great science fiction and fantasy writers. At the same time, some of the most significant research and collective work I've been a part of recently focuses on future-facing cultural memories, art, and activism inspired by Octavia E. Butler, the late great science fiction writer from Pasadena, California, who left behind a vast quantity of material that archivist Natalie Russell organized into over 350 boxes of material at the Huntington Library. Butler was a student at Clarion in 1970 and later taught for Clarion and Clarion West. Ayana Jamieson and Moya Bailey, who were among the first to hold fellowships to work on Butler at the Huntington, are the leaders in doing research on the Octavia E. Butler Papers. Jamieson is the founder of the Octavia E. Butler Legacy Network and is leading Pasadena City College's One Book/One College Program on Butler's Dawn at Pasadena City College. Butler's family states in a letter that they "especially wish to acknowledge and commend the scholarship, expertise, and guidance of Ms. Ayana Jamieson." Bailey is an assistant professor in the Department of Cultures, Societies, and Global Studies and the program in Women’s, Gender, and Sexuality Studies at Northeastern University. Her work focuses on Black women's use of digital media to promote social justice. I have learned a great deal from participating in the conference they co-convened at the Huntington on June 23, 2017 and from the conversations and collective research they have co-created. The Clarion Science Fiction and Fantasy Writers Workshop and the Arthur C. Clarke Center for Human Imagination present an evening with George R.R. Martin and Kim Stanley Robinson, held at UC San Diego in support of the Clarion Workshop. For more information, visit imagination.ucsd.edu and clarion.ucsd.edu. Here is a link to a news story about the event. The Arthur C. Clarke Center for Human Imagination hosted the San Diego premiere of the Paramount film Arrival, starring Amy Adams, Jeremy Renner, and Forest Whitaker and directed by Denis Villeneuve. After the film, I led a conversation and Q&A with Ted Chiang, whose novella "Story of Your Life" provided the basis of the screenplay. You can watch a video of the conversation below. 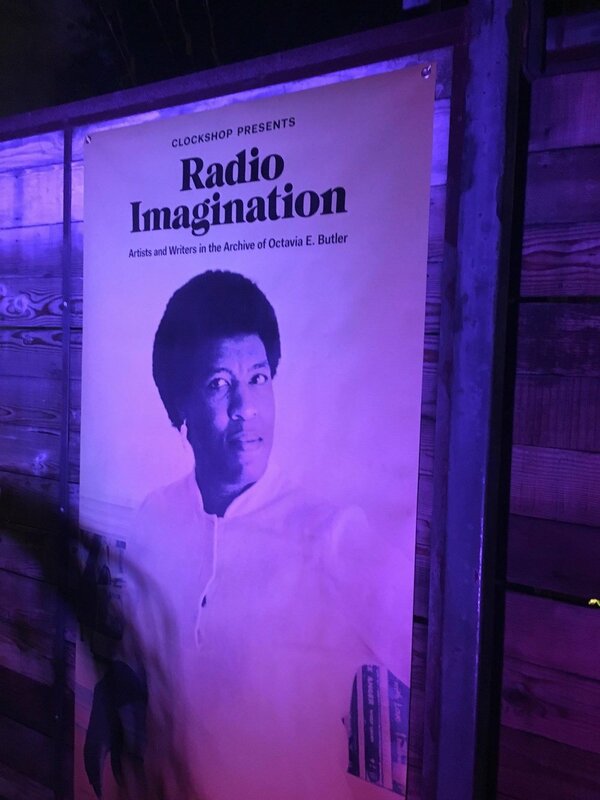 Radio Imagination celebrates the life and work of science fiction writer Octavia E. Butler. Organized by Clockshop, the 2016 program centers on 10 commissions that explore Butler’s papers at the Huntington Library. Radio Imagination artists and writers will conduct first-hand research in Butler’s archive at the Huntington Library and create new work based on their findings. New poetry and creative nonfiction by Tisa Bryant, Lynell George, Robin Coste Lewis, and Fred Moten will premiere at a public reading event. New contemporary artworks by Laylah Ali, Lauren Halsey, Malik Gaines and Alexandro Segade, Mendi + Keith Obadike, Connie Samaras, and Cauleen Smith will be presented in an exhibition at Armory Center for the Arts (October 1, 2016–January 7, 2017). Other public programs will round out this year of programming, including musical, scholarly and filmic investigations into Butler’s legacy. 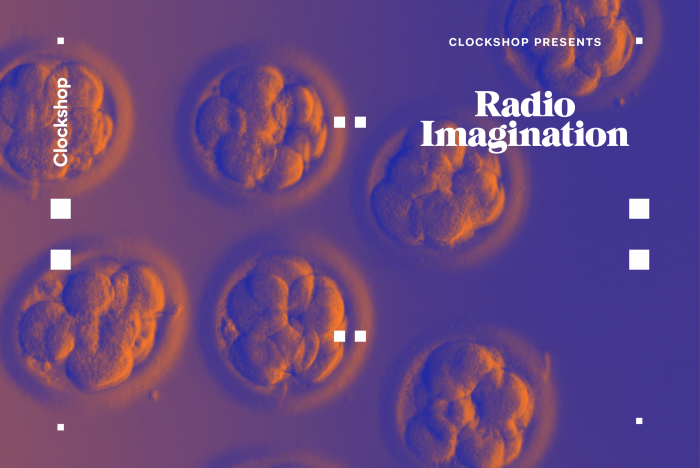 Radio Imagination is curated by Clockshop. Amy Kind is Professor of Philosophy at Claremont McKenna College (CMC). She joined the faculty in 1997 and previously served as Chair of the Department of Philosophy (2009–2012) and Associate Dean of the Faculty (2005–2008). At CMC, she teaches classes in philosophy, metaphysics, and logic. Her research interests lie broadly in the philosophy of mind, though most of her published work has concerned issues relating either to the imagination or to phenomenal consciousness. She is the editor of two forthcoming collections, Knowledge Through Imagination (co-edited with Peter Kung; Oxford UP, 2016) and The Routledge Handbook of Philosophy of Imagination (Routledge, 2016). Shelley S. Streeby works in the interdisciplinary fields of American Studies and Ethnic Studies, with a specialization in US literary, cultural, and historical studies through the early twentieth century. She is currently a professor at University of California San Diego. Her book Radical Sensations: World Movements, Violence, and Visual Culture (Duke UP, 2013) is about transnational movements in US literature and visual culture from 1886 to 1927, and she is also the author of American Sensations: Class, Empire, and the Production of Popular Culture (UC Press, 2002), which received the American Studies Association’s 2003 Lora Romero First Book Publication Prize. She is co-editor (with Jesse Alemán) of Empire and the Literature of Sensation: An Anthology of Nineteenth-Century Popular Fiction (Rutgers UP, 2007). Since 2010, she has directed the Clarion Science Fiction and Fantasy Writers’ Workshop and is currently working in the Octavia E. Butler archive on a new project about alternative worlds and near futures in speculative genres. Click HERE for a separate page of photos from and details about this conference. KEYNOTE: "READING OCTAVIA E. BUTLER IN SOUTH KOREA: RACE, SPACE, AND IMAGINING OTHERWISE"
This essay offers the late great Octavia E Butler’s work as an example of a Black diasporic speculative fictional practice from below that harshly illuminates and meaningfully responds to migration and demographic change; an emergent neoliberalism and ongoing imperialism and colonialism; the destabilization of national boundaries through global forces such as climate change; the eventual depletion of fossil fuels; and the volatility and violence of the global economy. I argue that reading Butler’s published work and her extensive archive of papers housed at the Huntington Library also requires us to think about how different kinds of technology reshape our sense of place, space, and the environment. In all of these ways, I suggest, Butler’s work anticipates and joins an emerging conversation about global inequalities, international and transnational divisions and connections, and climate change in recent science fiction and fantasy films in global mass culture, including some involving significant contributions by Korean cultural producers, most famously, The Host (2006) and Snowpiercer (2013), both directed by Bong Joon Ho. Wednesday, June 3rd, 5-8PM Atkinson Hall, UC San Diego Calit2 Auditorium Featuring a panel of affiliated CAT faculty K. Wayne Yang (Ethnic Studies), Shelley Streeby (Literature and Ethnic Studies), Joe Hankins (Anthropology), Adam Burgasser (Physics), Benjamin Bratton (Visual Arts) and Liz Losh (CAT Program Director); Performances by UCSD Graduate Students in music, visual arts, and creative writing; and presentations of CAT Undergraduate Student work; topped off with a great keynote by NYT best-selling author Jeff VanderMeer! 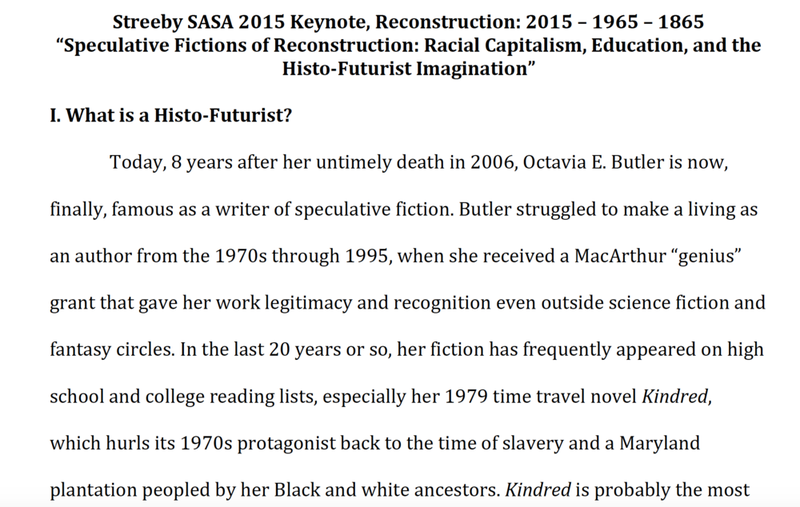 KEYNOTE: "SPECULATIVE FICTIONS OF RECONSTRUCTION: RACIAL CAPITALISM, EDUCATION, AND THE HISTO-FUTURIST IMAGINATION,” SOUTHERN AMERICAN STUDIES ASSOCIATION CONFERENCE: RECONSTRUCTION: 2015-1965-1865,” FEBRUARY 2015. 2013 Arthur C. Clarke Award for Impact of Imagination on Society: Ursula Le Guin, author of science fiction and fantasy works for adults and children. 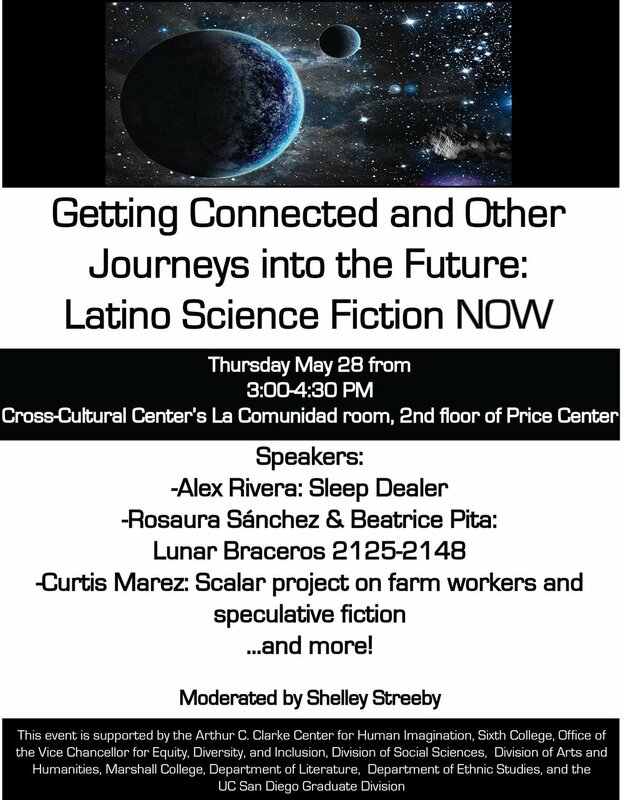 Presented by Shelley Streeby, Director, Clarion Writers' Workshop at UCSD.